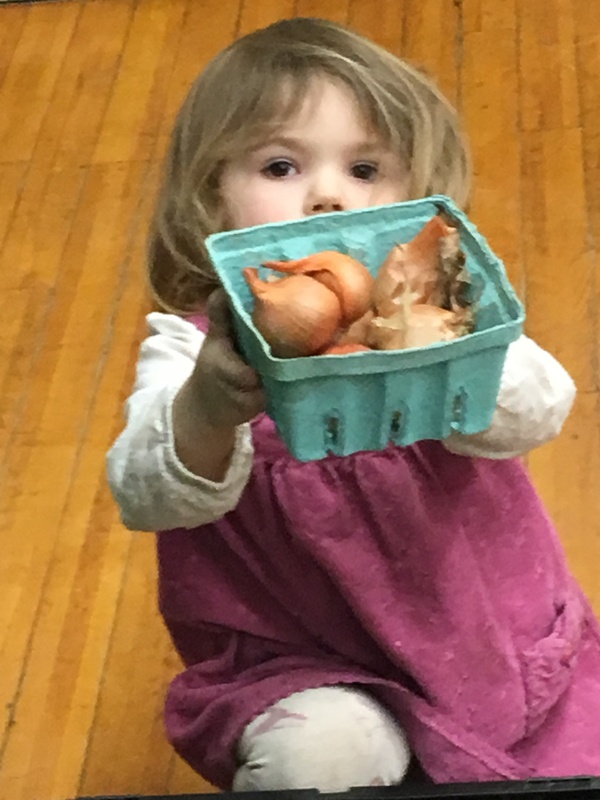 Fisher Hill Farm will have these little onions, carefully packed by Sophie, pea and sunflower shoots, microgreens, carrots, parsnips, potatoes, shallots, kohlrabi, turnips, beets, eggs, and frozen chicken, duck, and turkey. Stonecrop Farm is bringing a full selection of cuts of pasture-raised pork, including roasts, ham steaks, bacon, hocks (smoked and fresh), sausage, chops, and organ meat, as well as pasture-raised stewing hens and certified organic eggs. Andy’s Specialty Garlic & Produce will have certified organic salad mix, spinach, arugula, pea shoots, sunflower shoots, beets, and yellow onions. Shannon Brook Farm is featuring grass-fed lamb loin chops and lamb shanks and certified organic chickens, halves and wholes, and certified organic whole ducks. Lakestone Family Farm is bringing whole chickens, eggs, and the sweetest overwintered kale Denis has ever had, both green curly and red Russian. Happy Hooves Organic Farm will have organic 100% grass-fed and grass-finished beef cuts, sausages and assorted cuts from organic pasture-raised pigs fed no soy and no corn, organic eggs from free-ranging hens raised without soy or corn, raw wildflower honey, and candles and soaps made with organic ingredients from the farm. Bristol Mushrooms is bringing king oyster and lion’s mane mushrooms, certified organic. Bolton Farms will have butterhead bibb lettuce, spring mix, lettuce bouquets, broccoli raab, spinach, red Russian kale, curly kale, Tuscan kale, bok choi, escarole, spicy mix, cilantro, and beet greens. Flour City Pasta is bringing pasta made with local beets and kale. Newbury Park Pastries will have chicken, veggie, shepherds, panang, and (weather dependent) crawfish etouffee pot pies, plus sugar cookies and rugelach. We welcome musicians Charlie Freida and Friends to the market this week. We are pleased to be part of Farmers Markets ROC, a collaboration of Rochester area farmers’ markets that received grant funding to promote greater SNAP participation at our farmers’ markets. See FarmersMarketsRoc.com for more information. Brighton Farmers’ Market is held Sundays, 1 pm to 4 pm at the Brookside Center, 220 Idlewood Rd. (with a second entrance off S. Winton between Westfall and 590. The Market is sponsored by the Town of Brighton. More information about the market can be found at https://brightonfarmersmarket.org or on the Market’s Facebook page.